There has been an American presence in Aviano since the end of World War II. In 1954 the Italian and American governments signed a joint use agreement. 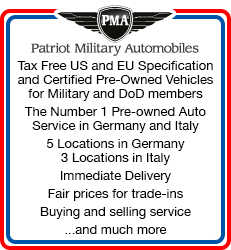 Aviano, the premier air base south of the Alps, is located at the base of the Dolomites at the northern end of the Po Valley, the largest agricultural plain in Italy. The host wing at Aviano is the 31st Fighter Wing, which maintains two F-16 fighter squadrons to conduct regional and expeditionary operations under NATO, SACEUR or national tasking. There has been an airport facility in Aviano since 1911. 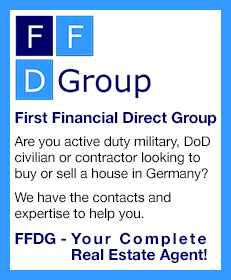 The Germans took over the airfield in both World Wars I and II and it fell to the British and Americans in 1945. The base is 35 minutes from skiing at Piancavallo and an hour from the beaches of the Adriatic. The closest large city is Pordenone, about 10 minutes away, and Venice is only an hour and a half away by auto or train. The village of Aviano is nine miles north of Pordenone (population 50,000), provincial capital of Pordenone province. Temperatures range from the low 20s during the winters to the upper 90s in the summers. The province of Pordenone offers the quiet appeal of its people-scale cities, towns and villages. Other points of interest in northeastern Italy include the cities of Gorizia and Trieste (castles) on the border with Slovenia; Aquileia, Grado (Roman ruins) and Lignano (beach) on the Adriatic coast; and Spilimbergo (mosaics), San Daniele Del Friuli (ham production) and Udine (Friulian artistic and historic center) in the inland hills. 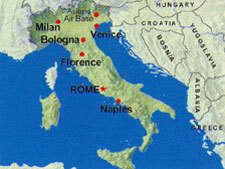 Venice is 53 miles away; Florence 210, Milan 215, Rome 381 miles away. Exploring Italy will be the highlight of your tour at Aviano. Few countries can match Italy for its sheer wealth of art and architecture, not to mention music, literature, the culinary arts, fashion and modern design. Italy's identity is reflected in its regional diversity, with a wide range of dialects, cuisines and architectural styles. Even within regions, you'll experience marked contrasts as the Gothic palaces of Venice give way to the timber houses of the nearby Italian Alps, or the Renaissance splendors of Florence are left behind for Tuscany's medieval towns. And when you tire of exploring the country itself, there's always the dining. Dining out in Italy usually takes longer than in the States. The typical day's dining in Italy is kick-started with milky coffee (caffee latte) and maybe a cornetto, a croissant with a jam or custard filling. Lunch and dinner typically start with appetizers (antipasto), and proceed to soup or pasta, followed by a main course of meat or fish and vegetables, and winding up with fruit and cheese and/or dessert. For more information check the Aviano website at www.aviano.af.mil. There are two Fitness & Sports Centers on base, where you can feel the burn with aerobic classes or workout with machines or free weights. There are also outdoor and indoor pools and a number of beautiful beaches within driving distance, plus facilities for bowling and golf. Aviano has an elementary school a middle school and a high school. All command sponsored family members under the age of 21 who have not graduated from high school or completed a GED must be either enrolled in and regularly attending the local DoDDS school, enrolled in an Italian private or public school or enrolled in a recognized home study program. Aviano DoDDS Schools currently have the resources to educate handicapped children in the learning impaired and communication impaired (speech therapy) programs. At the Elementary level, English-as-a-Second-Language is provided for students who speak little or no English or whose limited knowledge of the language may slow their progress in other subject areas. Government family housing at Aviano is treated as military family housing, but unlike traditional base housing, it is not located on base, but spread throughout the local Italian communities. All units are within a thirty-minute commute area, measured from the Wing Headquarters building to the entry sign of a town or village. Degree programs are offered by the Embry Riddle Aeronautical University, Central Texas College, University of Maryland and University of Phoenix. The Airman and Family Readiness Center (A&FRC) can help active duty AF families with emergency loans and grants, child care, car care for the deployed, spouse tuition assistance and baby care instruction. It also has a loan center providing cookware, dishes, utensils, appliances and the like for people awaiting their household goods. Aviano's 31st Medical Group is located on base and has Flight Medicine, Acute Care, Family Practice, Pediatrics, Immunization, OB/GYN, Orthopedics, Internal Medicine, Optometry, Laboratory and Pharmacy. The Pordenone hospital in the nearby town of Pordenone is the primary Emergency Room and offers a variety of medical services that may be used by Aviano AB members. The base Dental Clinic offers general dentistry to active duty personnel and their family members.There is also a Veterinary Treatment Facility. Red Cross services on base include verification of death or sudden illness, birth announcements and health and welfare reports. The Youth Program offers before and after school care during the school year and full-time holiday and summer day camp services during school vacations for children ages 6 through 12. Due to space limitations hourly care may be limited, but a waiting list is maintained. A variety of weekly, monthly and special events are available for youth in grades 8-12. Activities include trips to Vicenza, Camp Darby, Pisa, Verona and other local areas of interest; organized sports, talent shows, photography, fine arts exhibits, dances and Youth Employment Service (YES). The base chapel offers Catholic Masses, Contemporary, Gospel, Liturgical, Seventh Day Adventist and Church of Christ services. Activities include fellowship evenings and post-service fellowship; religious education for children, youth and adults, and men's and women's study and service groups. There is also confidential professional counseling for singles, couples, families, parents and children as well as advocacy in religious and in other areas. Please call the chapel for points of contact for the following groups: Jewish, Muslim, Orthodox, Lutheran, Episcopal and Mormon. Aviano's gleaming joint commissary and exchange mall, open seven days a week, sports Italian marble columns and the traditional clock tower found in Italian villages. It sprawls 193 yards long behind a massive parking lot, offering a dry cleaner, shoppette, toyland, furniture store, auto parts store, beauty shop, barber shop, military clothing sales store and newsstand, plus a Food Mall, with Taco Bell, Popeye's Fried Chicken, Anthony's Pizza and Baskin-Robbins Ice Cream. The commissary has in-store specialty departments such as a bakery, a butcher shop, a bistro, a deli and a fresh salad bar. The Library has more than 23,000 printed video, audio and computer resources. There is a Community Bank on base as well as a Global Credit Union. They provide a full range of services and ATM machines. With the on-base Italian Banca Popolare Friuladria you can pay your rent, phone and other bills through a monthly allotment. The Community Center offers a game room, cyber cafe, ballroom, big screen TV and video rentals. There is also a Wood Skills Center and an Auto Skills Center on base. Information Tours and Travel (ITT) offers full commercial travel services to include airfares, overseas travel, package tours and theater tickets. The 80-room Mountain View Lodge offers affordable and comfortable alternatives to local hotels and pensions. Its staff took home the 2007 Air Force Innkeeper Trophy.